When you see a pirate decked out in their battle gear, you are probably only seeing the tip of the iceberg. They may seem plenty scary waving their razor sharp swords and heavily-used pistols around, but pirates are nothing if not prepared. Under that big pirate coat may be a collection of knives, daggers, chains, pointy sticks, derringers, and blunderbusses! They'll use anything to get an edge over their opponents. If you need some extra steel to carry into battle, this trusty Skull Pirate Dagger will quickly earn its place in your arsenal. Actually, it's made out of molded plastic rather than deadly metal, but it will still make a menacing addition to your pirate costume. 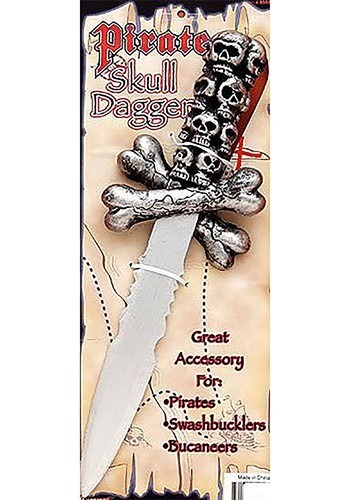 The skull grip and bony crossguard make this toy dagger a perfect fit for any stylish swashbuckler. Hopefully, you won't have to use it in battle, but even a pretend pirate must be prepared!